A New Kind of Program Designed for Virginia Residents. 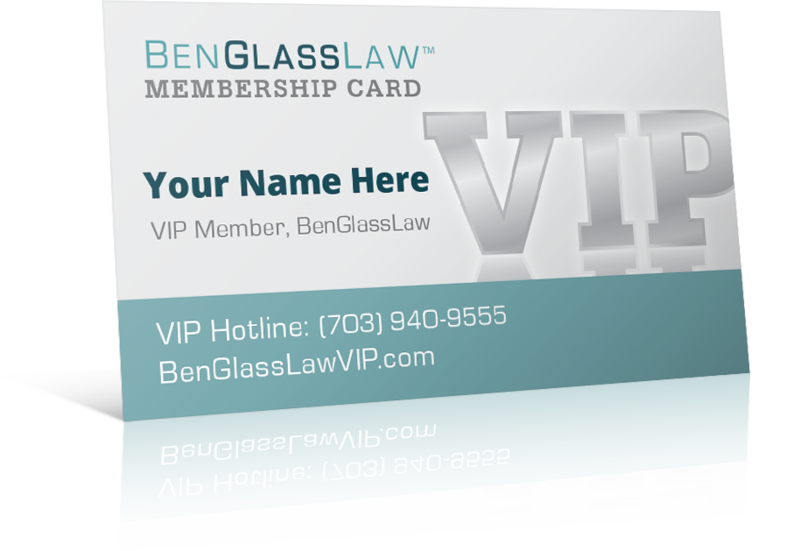 Learn More about Ben Glass's VIP Program! No surprise, many attorneys who hear about BenGlassLaw's VIP program find it too sensational to believe. They ask, "why would you offer all these free benefits, isn't it hurting your law practice." The honest answer is no, because we know that helping people with their small legal issues is just as important as helping them with their big legal issues. It’s been an honor serving this community for over 32 years, and we wanted to give back with a free membership program for our closest friends. Planning to sign a new lease, contract, or other paperwork and want an attorney to look it over? We will review family or small business contracts and other documents for you free. If you need a referral to an experienced attorney in another practice area, we will help you find the right lawyer for your situation. If you get injured, will your insurance cover you? What if someone gets hurt at your house or business? Find out before an accident happens. Send us your insurance policies and questions for review. No more long lines or silly fees at the bank. We will notarize your documents free at our Fairfax office. BenGlassLaw puts on big giveaways and contests several times a year. As a hand-selected VIP member, you are automatically entered for each giveaway. Good luck! When you become a VIP Member, you will receive a "hotline" phone number for immediate access to Ben's team. If you want to speak to Ben directly, we will schedule a phone appointment for you, no questions asked!